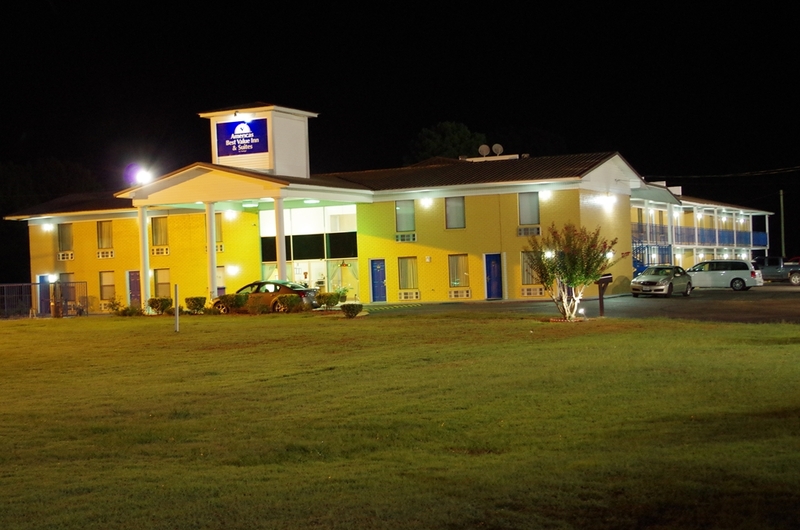 Come visit the Americas Best Value Inn Suites of Hope- Arkansas- the home of former President Bill Clinton. Our two story exterior corridor facility features 42 guest rooms- including 9 suites. We offer complimentary high speed wireless internet- microwave- mini-fridge- coffeemaker- 40 inch flat panel HD satellite television with over 100 channels- HBO- Cinemax- iron and ironing board and complimentary local calls in all rooms. Business travelers will appreciate our on-site meeting facilities. We serve a complimentary daily continental breakfast with biscuits- gravy- and waffles- and we have a guest laundromat on-site. Pets are allowed-charges and restrictions apply. Our experienced and friendly staff will make your stay with us a memorable experience. Located halfway between Dallas and Memphis on Interstate 30- Hope- Arkansas is a world-class southern community in the Texarkana metropolitan area. This small town in Southwest Arkansas has two claims to fame- it is the birthplace of former U.S. President Bill Clinton- and it showcases some of the world*s largest watermelons. The Clinton Center preserves President Clinton*s first home. Arkansas*s natural beauty and its history are showcased and preserved in the parks and museums of the Arkansas State Parks system. Find an Arkansas quilt shop- check out the ever-expanding fine arts scene of original artwork- the hand thrown pottery- and innovative pieces of jewelry. Enjoy the thrill of the hunt at the numerous Arkansas antique stores and flea markets. Some must see attractions Morning Star Missionary Baptist- the Clinton Birthplace Foundation- the University Of Arkansas Community College-Hope- Hope Public Library- Bridewells Lake- Porter Lake Dam- the Print Museum- Prescott Raceway Park- Cossatot Community College- the Clinton Presidential Library and Museum. Meeting Room: Can seat up to 80 people conference style. A/V equipment is available. Room has 2 bathrooms, kitchen and enclosed patio with BBQ grill. We are located on Hazel St between Hickory St and Bill Clinton Dr..